Here, near the headwaters of the Little Kern, is where the Golden Trout leg of the Hockett Trail begins, and the native country of my favorite variety of golden trout. Ladies and gentlemen, present … fly rods! … or just sit by the stream and enjoy the show. The Little Kern descends quickly, then levels out as it flows down a v-shaped canyon toward its confluence with Shotgun and Rifle Creeks. Trail 31E12, which once formed a shortcut between Wet Meadows and Coyote Pass, has been unmaintained since 1995 at least, but the recent Cooney and Tamarack fires may have helped to clear away the accumulated overgrowth (undergrowth to the trees; overgrowth to the trail). About halfway down the canyon, the trail enters another zone of meta-sedimentary schist and marble. The only way the cited passage could be true is if the trail skirted around the Great Western Divide, and met the Jordan (Dennison) Trail at Trout Meadows. Note that this traveler skirted around the Great Western Divide as late as July, and that he identified the name “Hockett Trail” with that circuitous route. Still, in spite of so much evidence, local common knowledge has it that the Hockett Trail had a late season branch over the Great Western Divide. Old hearsay dies hard. From Rifle Creek, unmaintained Forest Service Trail 32E02 follows the river south. The original Hockett Trail ascends southward over a saddle, then descends to join 32E02, and follows that same trail, also unmaintained, to Trout Meadows. After following the river for about a mile, trail 32E02 veers away from the Little Kern, and does not return to it, but there are places where it is not very far from the river. One such place is where the old Dennison Trail probably merged with the Hockett Trail, at Sagebrush Gulch. A short hike along the north side of Sagebrush Gulch on unmaintained trail 32E11 takes you down to the Little Kern ford where that mountaineer and man of leisure Dennison may have crossed on his way to the Coso Range. He probably came down off the Western Divide along Mountaineer Creek (wouldn’t that be appropriate? ), but we can access this ford more easily via Clicks Creek (also on trail 32E11). See Exploring the Southern Sierra: West Side by Jenkins & Jenkins: Coyote Lakes Backpack (T58) and Two Rivers Backpack (T59). Also see Hiking California’s Golden Trout Wilderness by Suzanne Swedo: Lion Meadows Loop (11) and Northern Golden Trout Tour (20). After crossing Hunter Creek, the incline increases as the Hockett Trail leaves the Hockett Plateau for the Western Divide. After ascending 850 feet, the trail reaches a ridgecrest that might deceive a traveler into thinking he’s reached the top, but he has another 300-foot climb ahead. All-in-all, it’s not a difficult ascent to the divide at Wet Meadows Entrance (9824′). The original boundary of the park actually extended eastward beyond Wet Meadows to a longitude line. Since 1978, the Wet Meadows Entrance has been an entrance into the Golden Trout Wilderness. The Western Divide is the divide that lies west of the Kern watershed, from Farewell Gap (above Mineral King) to the Greenhorn Mountains. It may be thought of as a branch of the Great Western Divide. It is not, as a whole, given a name on maps, so I take the name from the Western Divide Highway (California State Route 190). It is the first of two divides crossed by the Hockett Trail (the original trail skirted around the Great Western Divide). On the eastern side of the divide, the trail (31E11) descends toward the Little Kern. The first signs of Wet Meadows bring the trail to a group of large campsites and the roofless remains of a cabin built by the Pitt brothers. At the downstream end of the meadows, there is a rather well-developed camp worth visiting. Be warned, though, that the trail splits at the meadow, and the branch adjacent to the meadow is not maintained. Below the meadow, the trail encounters a trail to Quinn Patrol Cabin (31E13) on the right. From this junction, trail 31E11 continues toward Mineral King, and we descend in an east-southeast direction into the canyon of the Little Kern, taking care to stay south of the hump that rises just south of Wet Meadows Creek. The descent becomes increasingly more steep into the canyon. The last 400 feet are the worst. This route, once-upon-a-time trail 31E12, has not been maintained, or even used for many years, due to the facts that (1) trails in and out of Mineral King provide alternatives that did not exist in the 1860s, and (2) the Forest Service has not maintained trails in the Golden Trout Wilderness since 1995. Thankfully, some routes are maintained by packers, volunteers, and cowboys. There is hope, however, for this abandoned classic: the 2003 Cooney Fire may have cleared some of it for us. This leg of the Hockett Trail ends at the Little Kern River, where we reach the first trout stream in the native range of the California golden trout. 31E12 and the old Hockett Trail crossed the stream here, as the canyon is more navigable on the east side. The river is relatively calm here, and the canyon bottom is relatively broad. The outlet stream of Wet Meadows, the Little Kern’s first tributary, flows into the river just upstream. See if you can spot the benchmark 7923 on the east side of the river. See Exploring the Southern Sierra: West Side by Jenkins & Jenkins: Hockett Meadows–Little Kern River Backpack (T93). Clough Cave is not the only cave in the South Fork area. There are four that I have heard of, one of which was discovered in 2006 and featured in National Geographic. Hundreds of such caves occur in marble outcrops which appear in the Sierra’s eroding meta-sedimentary shell. There are at least a half dozen such outcrops in the South Fork area. At South Fork Campground we are confronted by a choice between (a) following the river to Ladybug and (b) ascending up the south face of the canyon. The original Hockett Trail stayed near the river to just beyond Ladybug. This is the most direct route, but it requires two additional river crossings, and adds a very steep ascent after Ladybug. The difficulty of the second crossing is not trivial. It is in a small gorge, and the river rushes precipitously downhill there. I lost a water bottle several years back attempting to ford the river just upstream. The last bridge that crossed at Ladybug was washed out (as were others) in the winter of 1969. After that, the Hockett Trail was no longer maintained from end to end, unless one considers the Garfield-Hockett Trail a branch of the Hockett Trail, which I do. The original trail does avoid snow in the early season, but I’ll take snow over snow melt just about every time. Consider Christopher McCandless. Still, Ladybug is a great spot for trout fishing and, of course, lady bugs. My friend Juan and I recently attempted to follow the old ascent up the big hill, but found that it was every bit as overgrown as we had been told. We found ourselves crawling through low-lying tunnels under thickets, hoping to come though to an opening, but the tunnels just kept on going. Nothing that a good fire couldn’t fix. The alternative is a long, strenuous haul up the north side of Dennison Ridge, but it offers plenty of shade, moderate slopes, frequent water sources, beautiful forests, stately campsites and all without any drowning hazard. Even with ice on the ground, this route is quite safe in most places. One of the last wild nesting sites of the California condor before its reintroduction was a fire scar in a giant Sequoia tree, just on the other side of Dennison Ridge. Dennison Ridge, Dennison Peak, and Dennison Mountain get their names from a mountaineer who blazed the first trail across the southern Sierra. It is said that he died after stumbling over his own bear snare, just on the other side of this ridge that bears his name. Legal camping on the Garfield route begins at Snowslide Camp, just beyond Snowslide Canyon, source of the infamous 1876 slide, what I like to call the “Centennial Slide” as a mnemonic. Downstream, at canyon bottom where the slide planted a small Sequoia grove, is the first legal campsite along the old route: Ladybug Camp. Above Ladybug, the old trail gets mighty steep and dry, so there isn’t really any other good camping along this leg of the old route. See Exploring the Southern Sierra: West Side by Jenkins & Jenkins: Hockett Lakes–Summit Lake Backpack (T86) and South Fork Kaweah River Day Hike (T87). The Hockett Trail was first chosen for its efficacy as a trans-Sierra route, and specifically chosen by the Union Army for its usefulness as a trail between forts in Visalia and the Owens Valley. Coincidentally, or perhaps not so coincidentally, the route of that old trail also traces the native range of California’s distinctive sport fish, the California golden trout. In addition, the Hockett route follows streams east and west of that native range. This makes the Hockett route an ideal route for the sport fisherman. The three watersheds of the golden trout are, from west to east, the Little Kern River, Golden Trout Creek, and the South Fork Kern. The Hockett Trail followed these streams from its crossing of the Little Kern at Wet Meadows Creek, down the Little Kern Valley, up Kern Canyon, Golden Trout Creek, and finally the South Fork Kern. The attractiveness of the Hockett route isn’t limited to the Kern watershed. On the west side, the Hockett Trail followed the Kaweah River from the Kaweah Delta to the headwaters of the South Fork Kaweah. On the east side, the Hockett Trail followed Cottonwood Creek, stocked with golden trout since 1876, before dropping down “Hockett Hill” into the Owens Valley and turning north toward the Owens River, yet another notable fishing stream of the region. Today, the Hockett Trail route and the trout streams along it enjoy wilderness protection from South Fork Campground on the west side to the outskirts of Horseshoe Meadows on the east side, largely due to the creation of the Golden Trout Wilderness in 1978. Unfortunately, fishing on the lower Owens River is not what it was before the Los Angeles Aqueduct, though efforts are being made to restore the stream. As for the state of the trail itself, it is not wholly maintained, and segments of the original trail were completely abandoned as far back as 1969 and 1940. Much of the original route is now paved over, and some of it has been under Lake Kaweah since 1962.
moving miners and supplies to and from mines in the Coso Range east of the Sierra. moving soldiers and their supplies to and from Fort Independence (AKA Camp Independence). This was primarily to defend and promote the interests of white settlers against local Indians. The first function, the commercial reason for the trail, is the reason why the trail was named after the Visalia businessman John Hockett. For this same reason, the Hockett Trail may also rightly share the name “Coso Trail” with the Dennison and Jordan Trails. The second, military function is the reason why it was also called the “Trail to Fort Independence”. Hockett and the Union Army worked together in developing the trail. The Hockett Trail found other uses before it was even completed. It served as a route for discovering and accessing new Sierra peaks and valleys. Mineral King was discovered by a hunter on the Hockett Trail crew in 1862 (Hale Tharp later claimed to have visited Mineral King earlier, but even if he did his visit had no historical impact). Ranchers appear to have used the trail to move their livestock to the Hockett Plateau during the drought of 1863. Though the Hockett Trail was the primary trail across the southern Sierra throughout the late 19th Century, it probably did not serve the Cerro Gordo mines, as they were not generally known until after the Hockett Trail lost much of its purpose as a supply route with the completion of the McFarlane toll road over Greenhorn Mountain in 1864, the opening of a stage service on that road in 1865, and the end of the Owens Valley Indian War in 1865. The city of Los Angeles gained dominated trade with Cerro Gordo by 1868, and her geographic advantage over Visalia became clear. By 1905, as work on the Los Angeles Aqueduct began, Owens Valley was in practical terms within LA’s city limits. The completion of Mineral King Road in 1879 diverted traffic away from the westernmost segment of the Hockett Trail, but it may have made the rest of the trail even more popular. The original Hockett Trail, often labeled the Trail to Fort Independence, can be seen skirting around the end of the Great Western Divide on area maps throughout Sequoia National Park’s first decade (the 1890s). Mountaineering, golden trout, and the establishment of Sequoia National Park kept the trail popular into the 20th Century. The first people to climb Mount Whitney, America’s highest peak until 1959, were fisherman who used the Hockett Trail to get to the Kern River, and the Hockett route continues to give sport fisherman access to some of the most striking freshwater fish in the world. This is the southern terminus of the High Sierra. South of these peaks, each of the three divides drops considerably, yet there is no easy way across the range north of Tehachapi Summit. The range continues to be rugged and there is progressively less reason to cross the range as one proceeds toward the southern end of the Sierra. The closer one gets to Tehachapi, the less reason there is to bother with a Sierra crossing. For good reason, the first trails across the Southern Sierra kept south of the High Sierra, but there were problems with this strategy. In avoiding the High Sierra, The Dennison Trail and Jordan Trail both crossed two canyons of the Tule River. The Hockett Trail, also known as the Fort Independence Trail, avoided the rugged Tule River watershed entirely by following the South Fork Kaweah River to the Little Kern. This route climbed to over 9800 feet, yet quickly became the preferred route to Trout Meadows, the grand junction of the Southern Sierra. It was difficult until the snow melted, but once most of the snow cleared from the popular trail it was an easier way to go. Above 8800 feet, the route is free of steep slopes, so even with some snow, it is rather easy going. Beyond Trout Meadows, the Jordan Trail and Dennison Trail encountered another difficulty: the Kern River. Directly east of Trout Meadows, Kern Flat offers a natural fording point, but it is less than ideal, particularly in spring when the river can be treacherous. The head of the Jordan party, Captain John Jordan, drowned at Kern Flat while returning west to announce the opening of his trail. The Hockett Trail, alternatively, followed the Kern Canyon north to a better ford, north of what was once named Volcano Creek, now Golden Trout Creek. The river has less volume upstream of Golden Trout Creek and Coyote Creek, and better yet, it splits into several rivulets for a short distance. A bridge was quickly constructed at Kern Flat that made the Jordan-Dennison Trail more safe. Ironically, it has been reported that Captain Jordan blazed a route up Golden Trout Creek as a late season alternate. Perhaps he would have been better off to select it as his main route, but then it headed a little too far north for his purposes. 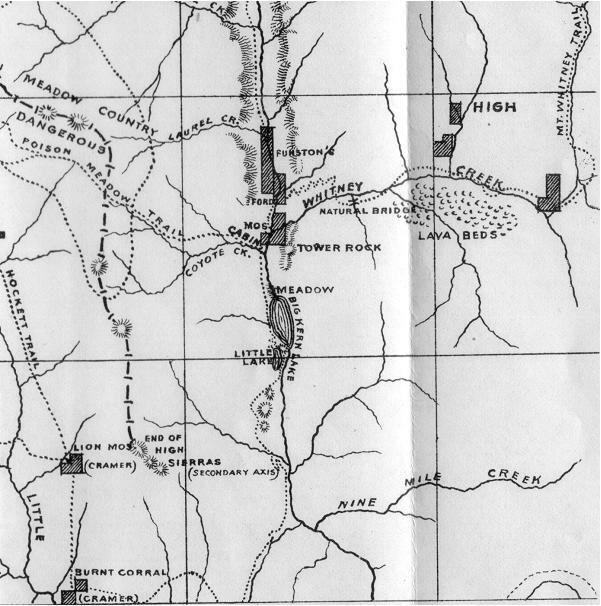 The Jordan Trail and Dennison Trail were trails to the Coso Mines, not to Lone Pine or any points north, and so they were temporary mining trails. They crossed the Sierra Crest by way of Olancha Pass and Haiwee Pass, and from the base of these exits, required a significant trip to get to the fertile, settled country north of Owens Lake. The Hockett Trail follows the lay of the range in a way that its sister trails do not, following ridges, plateaus, passes, seismic faults, saddles, canyon bottoms, and fords in ways that almost appear engineered. The original trail dipped south of the end of the High Sierra where it skirted around the Great Western Divide. Early accounts indicate that the original route appears to have been preferred till the end of the 19th Century. This original trail intersected the Coso Trail at the south end of the Great Western Divide, opening the route to southerly alternatives for crossing the range. Two options availed themselves to the traveler for ascending out of Kern Canyon, one on either side of Golden Trout Creek. As one approached the crest, one could also opt to cross at Cottonwood Pass, often taken by early Whitney explorers, but slightly more difficult so far as crossing the range is concerned. For those continuing along the main route to the crest, there is a choice between Trail and Mulkey Passes. Notwithstanding this abundance of choices, the primary route offered many outstanding benefits, such as an excellent ford on the Kern, a remarkably low ridgeline between the Kern and South Fork Kern watersheds, and relatively easy passage over the Sierra Crest. The Hockett Trail, given that it was a High Sierra trail, provided unsurpassed access to mining and recreational destinations. The beautiful alpine valley of Mineral King was discovered by the Hockett Trail crew, and the first ascents of Mount Whitney employed the Hockett Trail. As an added benefit, the Hockett Trail also provides unmatched access to every variety of golden trout, as it follows the Little Kern, the Big Kern, Golden Trout Creek, and the South Fork Kern as well. It might justifiably be called the Golden Trout Trail. The southern Sierra, from the headwaters of the Kern River in Sequoia National Park southward to the sweep of the Kern River into the far southern extreme of the Tulare Basin, is morphologically dominated by a single seismic fault that splits the range into western and eastern legs, and gives the range a southerly slope with a solar inclination that helps to give it a rather sunny, flammable aspect. This southerly descent is considerable. Though the two divides of the Southern Sierra feature peaks as high as Mount Whitney (14,495 feet) to the east and Mount Kaweah (13,802 feet) to the west, one need not travel far south before no more 10,000-foot peaks remain. In this sun-bathed high country, the trout seem to disappear and reappear in the golden light that flows through the rivers and creeks, as the flux of the streams sways left and right like a tree in the breeze. The gold trout sometimes seem custom-made for these sunward streams.